Looking for fast facts about the theater? Check out the fast, interesting, important and even little known facts about the Globe theater. Trivia Fact 12 - Advertising - Flags were erected on the day of the performance which sometimes displayed a picture advertising the next play to be performed. Trivia Fact 13 - Colour coding was used to advertise the type of play to be performed - a black flag meant a tragedy , white a comedy and red a history. Trivia Fact 14 - A trumpet was sounded to announce to people that the play was about to begin at the Globe Theatre in order for people to take their final places. Trivia Fact 16 - The Globe was built by carpenter Peter Smith and his workers and was the most magnificent theater that London had ever seen. It was built between 1597 -1598. Trivia Fact 17 - In Shakespeare’s time copyright did not exist. Rival theater companies would send their members to attend plays to produce unauthorised copies of plays - notes were made and copied as quickly as possible. Trivia Fact 18 - The Globe would have particularly attracted young people and the were many complaints of apprentices avoiding work in order to go to the theater. Trivia Fact 19 - A crest displaying Hercules bearing the globe on his shoulders together with the motto "Totus mundus agit histrionem" ( the whole world is a playhouse ) was displayed above the main entrance of the Globe Theater. This phrase was slightly re-worded in the William Shakespeare play As You Like It - "All the world’s a stage" which was performed at the Globe Theater. Trivia Fact 20 - Special effects at the Globe were also a spectacular addition at the theater allowing for smoke effects, the firing of a real canon, fireworks (for dramatic battle scenes) and spectacular 'flying' entrances from the rigging in the 'heavens'. Trivia Fact 21 - In just two weeks Elizabethan theaters could often present “eleven performances of ten different plays”. Trivia Fact 22 - There were no actresses. Female characters had to be played by young boys. The acting profession was not a credible one and it was unthinkable that any woman would appear in a play. 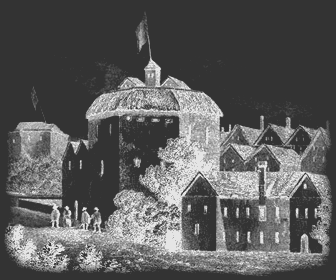 Trivia Fact 24 - Shakespeare's first biographer, Nicholas Rowe, referred to a role performed by William Shakespeare at the Globe theatre as "the Ghost in his own Hamlet" in which he was was "the top of his performance". Trivia Fact 25 - Published plays required a licence, which provided a form of censorship by the Elizabethan state. Trivia Fact 28 - The Puritans ended the Globe Theatre. In 1642 the Puritan Parliament issued an ordinance suppressing all stage plays. The Puritans demolish the Globe Theatre in 1644. Trivia Fact 30 - The site of the old Globe theatre was rediscovered in the 20th century and a reconstruction of a New Globe Theatre has been built near the spot. Details, facts and information about the Globe Theatre Facts in the Elizabethan Theatre can be accessed via the Elizabethan Era Sitemap.